April/May is that time of year when few Tillandsias want to flower, but it is the time to expect T. crocata with its bright yellow flowers and delightful perfume to perform. Also we see the bright blue of T. bandensis and at this time of year we can also expect a grey petalled flower in similar shape to the flower on T. bandensis and having 3-4 flowers per inflorescence. The plant although similar in shape is a bit smaller. No doubt you have this plant as T. erecta. 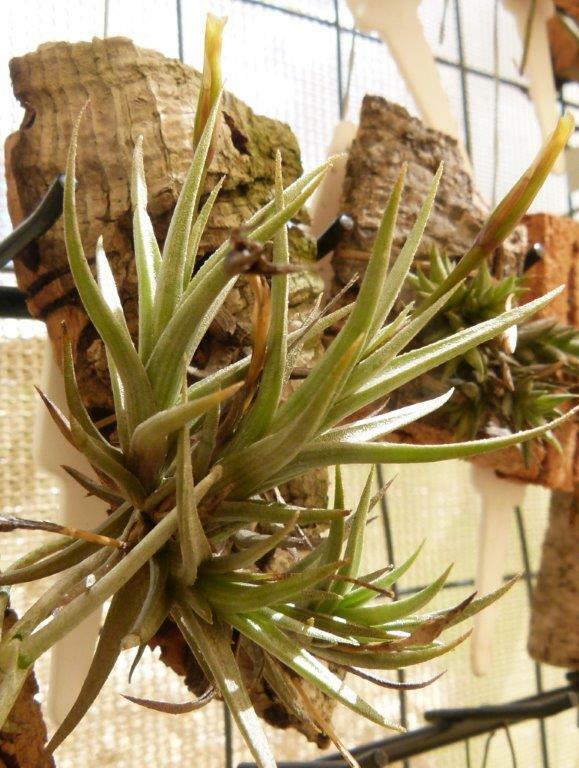 The interesting part is that this plant is NOT Tillandsia erecta but is certainly a hybrid with one of the parents being T. bandensis. 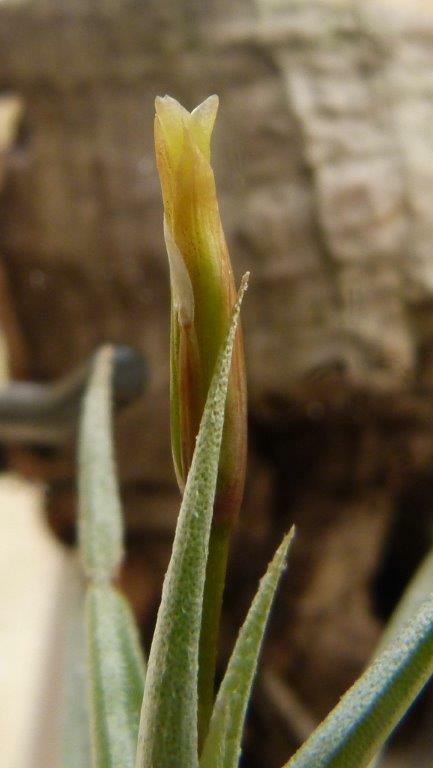 A true T. erecta is a smaller plant with an inflorescence having only one erect flower. The petals are a dirty yellow and remain erect, rarely opening. Back to our grey petalled plant hereafter referred to as Tillandsia 'Grey Power' for obvious reasons. I have considered Queensland Blue for equally obvious reasons because this problem originates in Queensland and the trail peters out there. They are very good poker players up there! The plant was in existence in Queensland before Rolly Reilly started his seed raising campaign but I could not find out if the plant had been imported or grown from imported seed. While a cross between T. bandensis and T. crocata would probably produce grey flowers, hybrid vigour would probably ensure a larger plant than either of its parents. In this case the plant is slightly smaller than T. bandensis so I felt the other parent had to be smaller too. It could even be T. erecta but more likely T. funebris (its very close cousin!) if it were a natural hybrid. I could find no reference to a hybrid occurring in this situation either man made or natural. I wrote to Dr. Walter Till of Vienna who is the world authority on these extra small Tillandsias. He confirmed my views on it being a hybrid and suggested another possible parent – T. myosura. He was unaware of this plant as a natural hybrid! I can assure you that this small plant with petals a delightful grey, offsets well and is widely spread in Australia. BUT, please change its name from T. erecta to T. 'Grey Power'. Perhaps it should have been retired years ago!